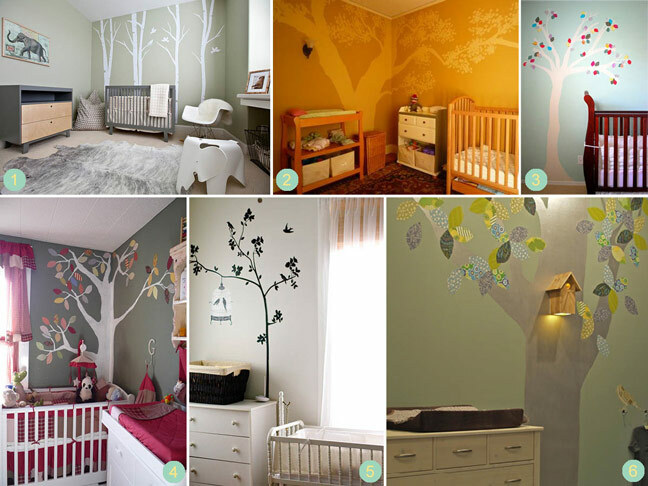 Let these trees inspire you to take your nursery to the next level. Try something creativelike the wood and nature inpired examples above. What do you get when you put all these great nurseries together? A forest! Trees add a decorative element to a nursery that won’t be quickly outgrown. They can be purchased as wall decals like the Branching Out Tree Stick On available at LandofNod.com (http://www.landofnod.com/family.aspx?c=9676&f=4356) or you can paint one yourself. Start with the trunk and work your way out to the branches. For leaves, you can make fabric appliqués that change with the seasons!